Perspective: One can get it when one looks at things from a new or different vantage point. Having the proper perspective is important in contemplating everyday things. It is also helpful when thinking about somewhat bigger things. We StumbleUpon-ed the image above while “working.” The image is of a spiral galaxy similar in size to the Milky Way galaxy in which our solar system resides. What really put things into perspective for us was what it was illustrating. Our own Milky Way galaxy is about 100,000 light years in diameter, containing anywhere from 200–400 billion stars. It is estimated that there are as many as 200 billion galaxies in the observable universe. The image above is an illustration of how far the first radio transmissions have traveled, in a galaxy the size of the Milky Way, since the signal left Earth over a hundred years ago. No, it is not the area covered by the red box. It is the area spanned by the blue dot INSIDE the red box. 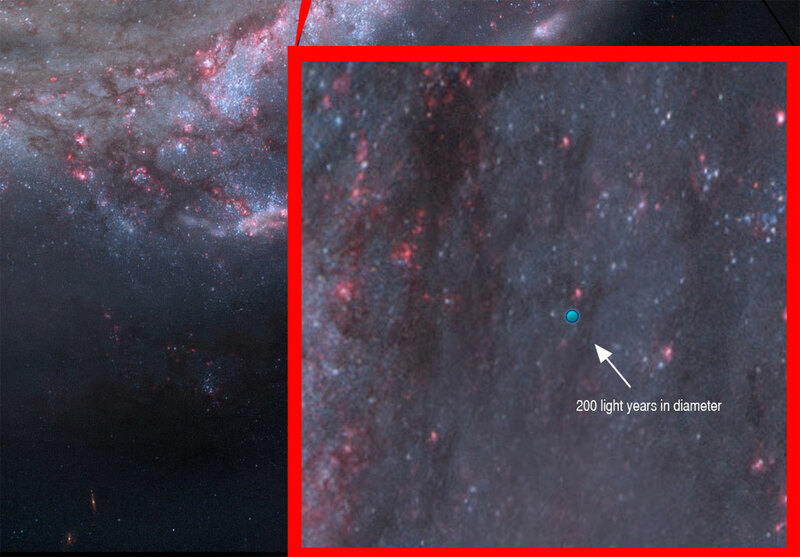 The diameter of the dot is 200 light-years. Now that is seeing the big picture. This realization, of course, has led to the question of just how many stars are inside this 200 light-year diameter spherical zone. After some research, we found that the answer is a bit vague. According to “Ask an Astrophysicist“, there are an estimated 14,600 stars which are within 100 light years from Earth. However, this is just an approximation, extrapolated from density information of about 5 parsecs. Fourteen thousand stars is a pretty small number compared to the 200-400 billion estimated to be in just our one galaxy, and there are hundreds of billions of galaxies in the Universe. The numbers used when discussing cosmology are often too big to comprehend. But what really put things into perspective for us was relating it back to something more concrete. Radio signals are the earliest indication to anyone outside of Earth that life exists here. However, in order for Earth’s broadcast to be picked up by anyone listening, they need to be inside the area covered by that blue dot. Anybody outside of the blue dot will have no idea of the signals as thye have yet to reach them…at least for anyone not able to travel faster than the speed of light.